I have a love/hate relationship with book emails. I hate them because they have me requesting stacks of books from the library that I can scarcely read as fast as they come in. I hate them because there are so many good books and not enough hours in my day. But do you know why I love them? I love them because they tell me about books that I needed to read. This time it’s Jen Doll’s YA debut Unclaimed Baggage. I saw the cover, because yes, sometimes the cover really does hook you, read one line of the description and hit “request now” on my library account before telling Rebecca that she needed to do the same. Unclaimed Baggage follows three characters, Doris, a loner who works at Unclaimed Baggage during the summers, Nell, a girl who has just moved from the Chicago suburbs to Alabama which also makes her a loner, and Grant, star of the football team who has fallen from grace. So, you know, all loners who are trying to find their way after their lives each changed forever. And find themselves they do, both through a store of lost things and newfound friendships. Both of us loved this book so much that we just knew that we had to chat with its author Jen Doll, a warm and lovely human who we want to keep in our pockets forever and read everything she ever puts out. GC: Congratulations! Unclaimed Baggage is finally out! How does it feel? Jen Doll: Great! Weird! It’s been almost 2 months since it was released to the world, and I have run the gamut of emotions. Publishing a book is never not emotional. Remind me this next time, please. Anything I’m feeling is JUST NORMAL RIGHT???? GC: Your first book, Save the Date: The Occasional Mortifications of a Serial Wedding Guest, was a memoir. What made you decide to make the switch to YA? JD: I had been writing about young adult fiction for a few years—I started a column when I was at The Atlantic called YA for Grownups—because it was what I always found myself reading. I did read other stuff too, but it was like the sweet spot of what I wanted to consume, literature-wise, it made me feel so much, safe and empowered and warm and fulfilled and challenged all at the same time, and I just loved it, and still love it. I think my brain was especially in a YA space after Save the Date came out. I had done this memoir and once you put your life on the page like that you start kind of thinking about the beauty and benefits of fiction (or at least I did), and I was especially interested in writing something that the younger me might have found helpful, and that young people today would find helpful and thought provoking. I had the incredible good fortune of some editors getting in touch and kind of being like, oh, you love YA, have you ever thought about writing YA? And I was like huh! That’s a good idea! I started working on a YA novel. And here we are. GC: What was the process like going from memoir to novel? Did you find that it was any different? JD: Writing is writing, of course, and it’s still the same struggle to make yourself sit down and do it and fight with the emotional and psychological demons that tell you you are bad and worthless and why are you trying to write anything anyway shouldn’t you just wash the dishes or something? But fiction is both more fun and harder, I think, at least for me. You have endless possibilities in any single moment. It’s almost paralyzing, the amount of choices! Whereas with a memoir, you have the truth and your memories and where those two things coincide. As a journalist, I’ve had a lot of practice writing nonfiction and personal essays, and I adore that kind of writing and feel perhaps a bit more confident in my skills. A novel was like, oh, I have no idea what I’m doing. I think about the E.L. Doctorow quote a lot, that “Writing is like driving at night in the fog. You can only see as far as your headlights, but you can make the whole trip that way.” Which, to be honest, I also think about while driving in the fog. I would rather be writing! GC: Okay, on to the story! Unclaimed Baggage is a real store! What made you decide to set a story there? JD: I grew up in a town in Alabama that had an outpost of Unclaimed Baggage! We went there all the time. This was not the flagship store, which is still in Scottsboro, Alabama (I went there on book tour! It’s incredible), but a much smaller store that really had its own personality and vibe. I was always fascinated by the untold stories it contained, and I thought the setting was an incredible, rich spot for 3 teenagers to find one another while unpacking other people’s lost belongings. It gave me a chance to imagine some of those stories. GC: Doris, Nell and Grant are sort of lost in their own way, so it’s fitting that they are found in a store filled with other lost things. Was that intentional? GC: Right off the bat, the Southern mentality is fully on display in various ways. Let’s first talk about church and how heavily it plays into the story. Do you think some people, like they point out to Mrs. Stokes later on, use the church as a cop out for being judgmental or rude? For instance, when Doris isn’t taken seriously after the water slide incident and is told she wasn’t acting very Christian? JD: I absolutely think that hypocrisy is real and all over the place, whether it’s Christians who aren’t behaving the way they should or vegetarians who still eat meat. We are all humans and we are all flawed and complicated and probably carry at least a few of our own inherent contradictions. With Mrs. Stokes, well, she’s awful, obviously, and someone who is very clearly using the church in a way that is not good for anyone, including herself. It’s extra awful considering that she’s in an authority position, and that she’s part of shaming Doris for behavior that wasn’t Doris’s to begin with. However, I wouldn’t say this hypocrisy is necessarily a Southern mentality, I think it’s an everywhere mentality that we need to challenge in ourselves. When we say we’re being one way or one thing, are we really? Is kindness and openness central to our acts? How do we behave in a better way to the people around ourselves? And part of that, too, is challenging the attitudes we hold, or that we see others hold, just because we grew up with them or they were passed down or they’re what people around us do. We need to all think for ourselves about the very best choices we can make, for ourselves and for those around us. GC: Similarly, down the line, there’s the racism that Ashton and Nell face when he visits. Why do you believe it’s still so jarring to read something like that in 2018? JD: America has absolutely not dealt with its history (and current reality) of racism, as we’re seeing now. That racism is still alive and ugly as ever, and certainly not just in the South. I think perhaps that moment in the book is so jarring because we want to believe that we’ve gotten past this … and we clearly, as you can read in the news daily, have not. GC: Furthermore, the South holds football close to God. Grant’s misdeeds, that are actually really bad, are overlooked and hushed up because he’s the star of the football team. Are these harsh looks at Southern mentality meant to explore how backward it is to still think like that? JD: I again wouldn’t put this to “the South.” The South is where the book takes place, sure, and it’s a place I know, but I don’t think that what happens to Grant—a football star who his coach wants to keep playing football, regardless of some obvious reasons why he shouldn’t—is confined to the South. There are so many young athletes in this country who aren’t given all the information they need about CTE, for example; adults often don’t come in to protect young people when they should. And one of the things I wanted to explore is the idea of a kind of toxic masculinity that means young men aren’t given the language to talk about how they feel, and to know that there are other options for them. Grant faces all of that… it’s part of what makes him drink in the first place. But, I mean, yeah, the South does love football! Roll Tide! GC: Speaking of Grant, what made you want to make him an alcoholic? Teen drinking is obviously going to happen, but his drinking is a full blown addiction that rippled out to others. JD: I don’t know if I wanted to make him an alcoholic, he just WAS… I think for a lot of the reasons above, this was just a habit inherent to his character and something he was going to have to try to figure out through the arc of the book. I also think that in America we really demonize alcoholism and alcoholics, but it’s a disease and it’s something a lot of people face, because the addiction always ripples out to others. We need to open up the conversations about it and try to remedy the situation and offer support instead of just placing blame. GC: Let’s talk about how the book is filled with preconceived notions of others that are very often wrong. For instance, Grant having it all and Chassie being jealous of Doris. What were you hoping to say? JD: When you look at someone else, whether it’s online or in real life, it’s very likely that you’re only seeing a part of them, which is what they put forth for you to see. There’s so much else there. I wanted to encourage people to take the time to look and listen and to really consider what other people are about. It’s like, you might think someone is perfect and has no problems and feel jealous of her life, when really she’s facing stuff that she’s never told anyone about. We all, like lost luggage, contain stories, and our outsides don’t always match what’s inside. Again, it’s a call for empathy, even when we think we have someone figured out. GC: We also firmly believe that no mix is perfect without Harry Styles as we think he’s too pure for this world. Who else do you believe should always make a playlist? GC: What do you want readers to take away from this story about lost things finding their way again? JD: It’s OK to feel lost. We all do! But don’t let it keep you from being found, or finding someone else, because there are so many connections a person can make in a life, and they are all so valuable. Also, I hope they never look at baggage claim quite the same way again. GC: Okay! Fun questions! If Unclaimed Baggage were to become a film (Okay, but is it? ), who would you cast? JD: I am afraid to go too far down this rabbit hole in the case of jinxing something but what is Reese Witherspoon doing these days, I’m sure she wants to play Stella, RIGHT? GC: What’s your writing process like? JD: Erratic (I am always on another deadline), but luckily, I type very fast. I try to write at least SOMETHING every day. GC: What’s your best writing advice? JD: Stop reading Q&As from other authors, open the document, and go. 🙂 Oh yeah, but definitely DO read. As much as you can. GC: And finally, what are you reading right now? JD: I am reading a book called Black Holes, Wormholes and Time Machines, by Jim Al-Khalili. It is not YA, but it is definitely research. 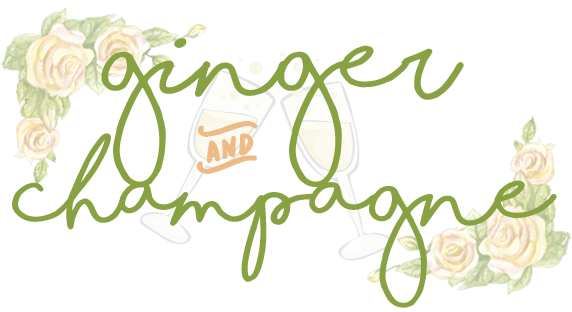 We here at Ginger & Champagne are so grateful to Jen Doll for this amazing interview and for writing such a beautiful novel that we both adored reading. You can pick up your copy of Unclaimed Baggage TODAY from your local or favorite digital bookseller! And don’t forget to follow her on Twitter! Wow this really makes me want to read the book! I too am a big fan of YA even though I’m in my 30s. I’ll put this on my must read list. Ahhh what a lovely review, it’s awesome when you find an author like this! Yay! I always need ideas for books. Thanks! This is a very compelling interview, I am so glad you shared this with us because I have been looking for a book like this to read on my upcoming travels. Thank you! What a cool interview article. I always love to here the why and behind the story from the creators. Thank you for sharing. It’s always so interesting to hear the personal stories of writers. Very cool! This sounds like such a great read! I loved your review and you’re making me want to take the time to read more. Sounds like a great read. I’m with you in the love/hate relationship with book emails. This was so awesome to read – I gotta check that book out! Very compelling interview! Thank you for sharing! So cool! This was so fun to read! Definitely need to check the book out! This sounds like an interesting read! And how fun that you got to chat with the author!